A wonderful small to medium evergreen shrub Pieris japonica varieties range from around 1m – 3m in height. Slow growing and preferring dappled shade it is also known as ‘Lily of the Valley Tree’ (see picture right). They are a Japanese native shrub, Japanese Andromeda is another common name. With low growing varieties such as P. japonica pygmaea and P. japonica william buchanen through to taller varieties available for sale up to 3m in height. With deep green leaves, and reddish copper new growth they make a good specimen plant or even a border. The small and waxy flowers from white to deep pink hang in delightful tassels in late winter early spring. Variegated forms such as P. japonica variegata add extra interest. P. japonica valley fire with white flower heads orange-red -pink new growth changing to cream then green is a vigorous form that produces a great show of flowers. Valley Valentine has deep raspberry red flowers in spring. Temple Bells has classic white Lily of the Valley like flowers. Spring Candy is a dwarf type, excellent in a container in a shady courtyard. 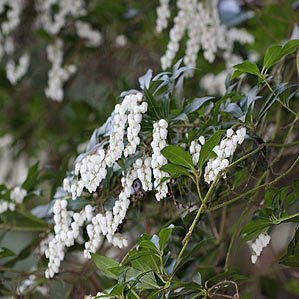 Saraband is a very compact form, low growing to 1m with deep green foliage which acts as a good contrast to the snowy white flowers. P. japonica var forrestii is a more upright and taller form with white flowers. All species prefer a well mulched soil and partial shade. Growing well in similar conditions to rhododendrons and azaleas, look for a position with moist slightly acidic soil part shade and definitely with protection from the hot afternoon sun. One of the joys of Pieris japonica is that they require very little pruning, they can be grown for many years with no need to prune them at all. These are naturally slow growing and generally require only the removal any dead or damaged wood. This can be done at any time of the year. If you need to prune to shape, or maybe a little tidy up, the best time is immediately after flowering. This is before the new flower buds form in summer. Hard pruning of larger plants can be carried out in late summer. Then lightly prune the new shoots in spring to bring the plant back to shape. P. Formosa and P. ryukensis are other species available as garden plants in Australia.